Thinking back to 2015, two fish stand out. One was my largest trout caught to date on a fixed line rod, a very nice 19.5" rainbow. The other was my first ever shorthead redhorse sucker. Although the redhorse was shorter at 17 inches, it put up a much, much better fight - by far the best of the year. I was really very surprised. I remember once reading a comment from a guy who said he had nothing against trout, but he was quite upset that so many nice redhorse streams were closed to fishing when trout were out of season. I was in Wisconsin's Driftless region, which is epic trout water, but after catching the redhorse, I understand his sentiments completely. I think I'm gonna need a bigger net! 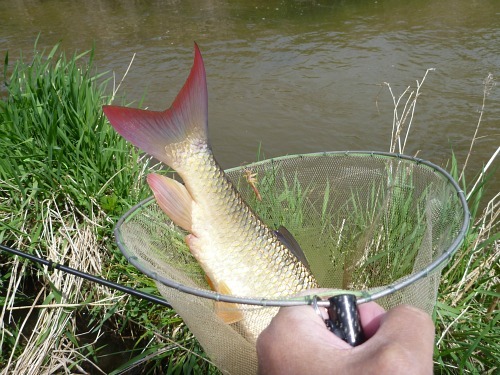 I bet they're called redhorse because they have a red tail and they pull like a horse! 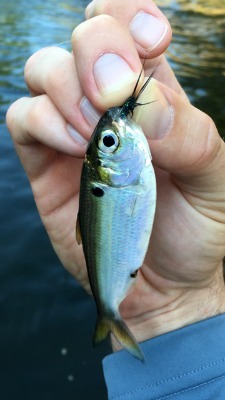 Inch for inch, they will outfight a smallmouth bass (which inch for inch will outfight a trout). I caught the redhorse on a Suntech Grayce II. One of the nice things about the Suntech Grayce II is the wide range of tippets it can handle - from 9X all the way to 5X. On the day I caught the shorthead redhorse, I had been fishing 6X tippets with a different rod. I had hooked several redhorse but every one broke off. I switched to the Grayce II, kept the size 3.5 fluorocarbon line and Killer Bug, but switched to 5X tippet - and landed the next redhorse. Another nice thing about the Suntech Grayce II is that at 31 or 32 pennies, depending whether you are fishing the rod at its 4.7m length or 5.2m length, it can handle good sized fish. The Grayce can handle light tippets as well. The following month, I used the Grayce II again, this time on a stream closer to home and as a keiryu rod, drifting a small red wiggler through pocket water on an extremely light line. The trout weren't nearly as big (or as spirited), but the Grayce II performed admirably. It's not a zero tension rod, but it can handle 9X tippet, which is as light as you could ever possibly need. Honryu Tenkara Rod or Keiryu Rod? In the past year, there have been several new offerings of 4.5 meter honryu tenkara rods. Personally, I would choose the Suntech Grayce II over any of them. With the Suntech Grayce II, you can fish the rod at 4.7 meters and then extend it to 5.2 meters after you hook a fish, making it easier to get the fish into the net. It is a firmer rod than any of the honryu tenkara rods, so it will not be as smooth casting and you will probably want at least size 3.5 line, but it will give you more control over a good sized fish. Finally, and to me most important, if there is room to fish a 4.5 meter rod, there is certainly room for a 4.7m rod and very likely to be room to fish a 5.2 meter rod, which will give you better drag-free drifts. One thing that is nice about the Grayce II is the relatively wide grip. That makes it comfortable to cast the Grayce II one handed at it's shorter 4.7m setting. I have fished the rod one handed, mostly because I always use a wading staff and it is often easier to cast one handed than drop the staff, make a few casts and then retrieve the staff to take a few steps. The more I fish with two handed rods, though, the more I realize that for longer rods (over about 4m), casting with both hands just makes a lot of sense. 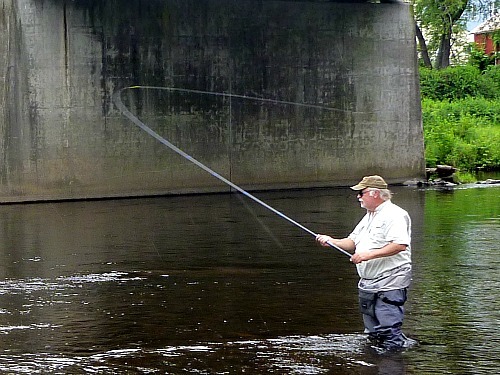 Fred Krowchenko (Spey Casting North East) demonstrating two handed cast. Most tenkara anglers have not yet tried two handed casting, but it is something that once you have done for a while it just makes so much sense. It is much easier on your joints, and holding a light 4.7 or 5.2m rod with both hands completely eliminates any sense of tip heaviness. Truly, all 4.5m tenkara rods feel a bit tip heavy. When held with both hands, the 5.2m Suntech Grayce II doesn't - at all. You can feel the micros! Although I don't always do it, dropping the wading staff encourages you to make more than one cast from a given location, thoroughly exploring all the possible lies you can reach. Perhaps more important, it also greatly discourages casting and walking at the same time. Takes are occasionally so subtle that if you are moving while your line is moving, you cannot tell if the little jiggles in the line are from your movements or from a fish. The Grayce is just firm enough to give you excellent sensitivity. You will feel hits that you would miss with a softer-tipped tenkara rod. I don't think anyone would choose a Suntech Grayce for micro fishing, but it is sensitive enough that you can feel the takes of very small fish. Think about it, if you can feel it when a micro takes your fly, you will be able to feel even very subtle takes from trout. 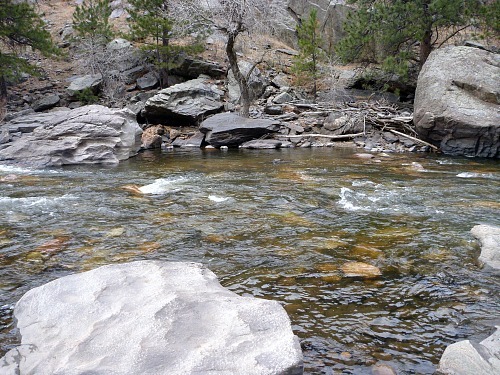 Not long after tenkara was introduced to the US, described from the outset as a method for fishing small mountain streams, people started to argue that it isn't limited to just small streams. They were right, of course, but what they didn't know then (and most still don't realize) is that while tenkara rods are ideal for smaller streams, the longer, two handed keiryu rods are much better tools for fishing big water. What's big water? If you can't reach the bank eddies on the far side AND keep your line above the intervening current, the water's too big for your rod. Of course, if you are fishing the Madison or the Delaware, you'll never reach the far bank, but still, the longer the rod the better. 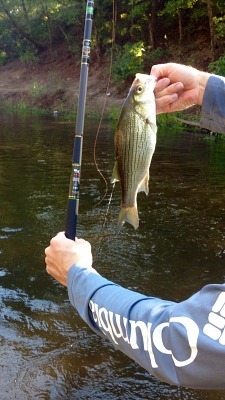 Low overhead tree branches limit the length of rod you can fish. If there are no low branches overhead, a 5.2m rod will give you better drifts than a 4.5m rod. If you are fishing with a keiryu rig (very light line, markers and split shot or tungsten bead head nymph), you will definitely appreciate a longer rod. Adam K demonstrating big fish technique learned from watching videos of a keiyru master fishing for salmon and steelhead. You will also appreciate a longer rod if you catch larger fish. It is much easier to turn a fish than it is to stop a fish. With a longer rod you can put much more side pressure on a fish to guide it out of current and into quieter water. It is a very powerful technique and one for which you cannot fully realize its value until you try it with a long rod. The rod is not just strong and light, though, it is a very handsome rod. The grip section shows off the carbon weave except for the actual nonskid grip area. Most of it is a glare-free matte clear coat. The zooming section is a standard black gloss except for the portion that extends beyond the grip section when the rod is at its 4.7m length. 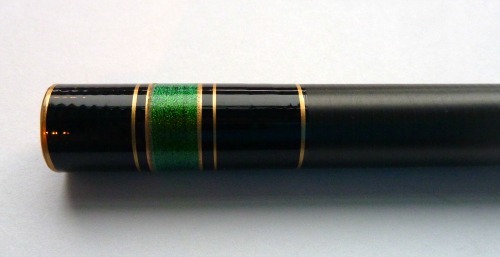 That portion has the same nonskid material that is used on the grip itself, followed by very fancy black, gold and emerald bands that are repeated at the ends of all but the last three sections. Except for the grip and zooming section, the other sections of the rod have the Suntech "non-paint" finish, which is a very nice dark gray matte finish that will not flash in the sunlight to alert fish to your presence. One of my customers said that the TenkaraBum 36 was the best looking rod he owns. All I can say is he hasn't seen the Suntech Grayce II! This is the best looking rod I've ever seen. I wouldn't go so far as to say it is keiryu rod as jewelry, but face it, many, many people buy watches that look great rather than just tell time, and cars that look great and sound great rather than just get you to work and back, so why not have a rod that looks great, too? Although the good looks will grab your attention, perhaps the biggest difference that people will see in the Grayce II is the rod tip. There's no lillian! If you fish with a level line you can use the standard level line connection (arbor knot). 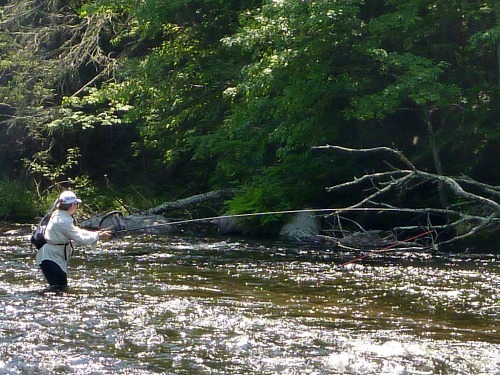 If you are using a thin keiryu line, use the same girth hitch connection that you would with a furled tenkara line. In either case, make sure the knot is pulled tight. And be doubly sure you don't pull the tip sideways when checking the knot! I have not had either a tenkara line or a keiryu line slip off the Grayce II. I have lost lines that were attached to lillians. Granted, I have fished rods with lillians hundreds of times more than I have fished the Suntech Grayce II, but if the connection was really bad, I would have lost a line the first time I tried it. I did fish with a guy who was interested in buying the rod, and he did lose his line. I don't know why he did and I haven't (and Adam K hasn't either). Why dispense with the lillan? 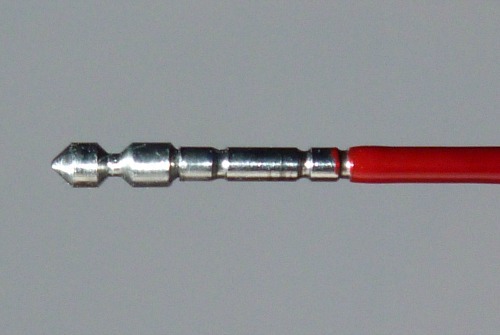 Tying the line to the rod itself is a more direct connection between rod and line. The lillian, even if it's only an inch or so long, adds a bit of slack to the system. If you want the ultimate in sensitivity you eliminate all the slack you possibly can. The grip screw cap is what you would expect from a multi length Suntech rod. 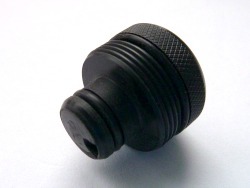 It is plastic, uses a rubber O ring to hold the zooming section securely, is knurled for easy tightening or loosening, and has a hole for ventilation. NP52 length and weight from my own measurements, NP62 and NP71 from Suntech specs. Suntech Grayce II NP62 and NP71 available by special order. The Grayce is an EPIC rod. I am having so much fun with it. The action is extremely smooth for a rod that has this much power and backbone. It is by far my new favorite rod. Amazing piece of carbon fiber! Can't say enough about the rod. VERY sensitive! !